Rated payload for the new 777G is 98.4 tons (89.4 MT), with a standard-body volume (SAE 2:1) of 83.8 cubic yards (64.1 m3). The design of the 777G, which replaces the 777F, focuses on fuel efficiency, enhanced visibility, and operator comfort, convenience, and safety. The new 777G's Cat C32 ACERT engine meets US EPA Tier 4 Final as well as EU Stage V emission standards and is available in configurations to meet emission standards of less regulated (LRC) countries. The engine delivers 1,025 gross horsepower (765 kW) and incorporates a number of fuel-conservation features. Auto Neutral Idle allows the 777G transmission to intermittently shift to neutral when the truck is idling in a forward gear to avoid stalling the torque converter and increasing engine speed. Engine Idle Shutdown, an operator-selected feature, stops the engine when the truck idles in park for more than a preset interval. Speed Limiting provides an alternative to gear-limiting the 777G by allowing the truck to travel at a more fuel-efficient engine speed and in a more efficient transmission gear. 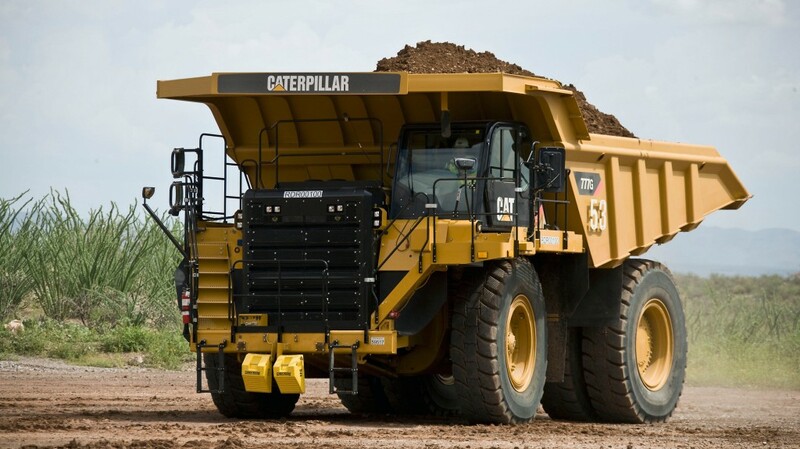 Advanced Productivity Electronic Control Strategy (APECS) transmission controls boost fuel efficiency by maintaining momentum and speed on uphill grades during shifts. In addition, the 777G has two operating modes, Standard Economy and Adaptive Economy. Standard Economy saves fuel by reducing engine power by 0.5 to 15 percent, based on the fleet and economic conditions at a particular site. Adaptive Economy requires a production baseline for the site using the Advisor display, and then, as the truck travels the haul cycle, the system automatically evaluates the power rating needed to meet baseline requirements. Full power is applied when needed, and reduced power is applied when appropriate. The efficiency of the 777G's performance is further enhanced by 7 percent more engine torque and an increase in top speed. Operator safety is a primary design factor for the 777G, with roll-over and falling-object protective structures integrated into the cab's design. Laminated glass is used in the front and left windows, and emergency egress is provided via a right-side hinged window. A ground-level engine-shutdown switch is readily accessible, and a secondary steering system is provided in the event of the primary steering system failure. Powerful wet-disc brakes are used at all four corners and provide parking brake and slope-holding capability. Brake life can be extended with an available engine brake, and a brake-wear indicator facilitates timely maintenance. Automatic retarding adds to positive control on downhill grades, and a new steering-sensitive traction-control system assists when ground conditions deteriorate. The 777G's major structures are designed for long-term durability in harsh operating conditions, engineered to endure through more than one power-train life cycle. Box-section castings are used strategically in high-stress areas, a new front frame design increases the approach angle on ramps and grades, and a heavy-duty rear axle housing axle allows increased lubrication and filtration of critical components. The Dual Slope Body, designed for optimum material retention on haul roads with steep slopes, carries material low and centered for stability. Heaped capacity is 78.8 cubic yards (60.2 m3) in its standard configuration. Two side-board sizes increase capacity for lighter weight materials. The X body has a flat floor and facilitates metering material into a crusher; standard heaped capacity is 83.8 cubic yards (64.1 m3). Rubber or steel liners are available for both bodies. Light-material bodies provide capacities to 165 cubic yards (126 m3). Tire life can be extended for the 777G with the TKPH/TMPH feature that calculates tire loading, and a mud-protection package is available to help keep power train components clean. Hydraulic-oil filter life is 1,000 hours under normal conditions. Fluid-fill and extraction points are grouped for convenience, and all check points are located at ground level and lighted for night access. A master disconnect switch, engine lock-out switch, and hydraulic lockout switch provide a convenient method when servicing the 777G.